The tuberous begonia, Begonis x tuberhybrida, is a hybrid cross of species from South America and Southern Africa. 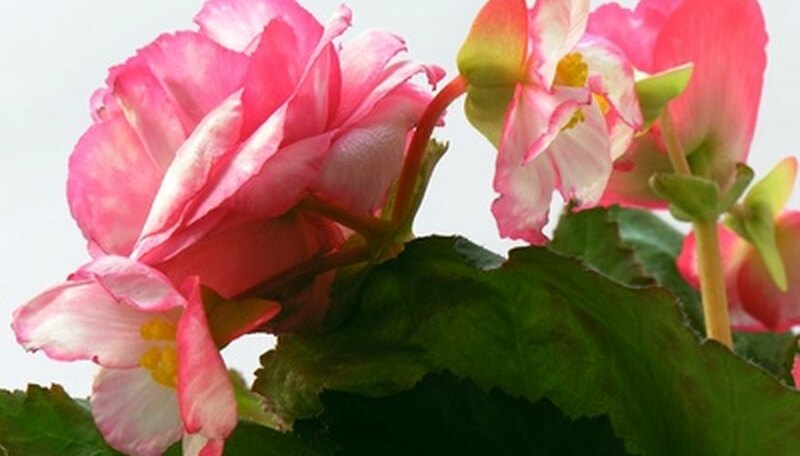 Many cultivars have been developed, resulting in upright or trailing tuberous begonias and single or double blooming tuberous begonias, but they all need the same growing conditions. All can thrive in garden beds, containers or raised beds. The trailing begonias are a good fit in hanging baskets and window boxes. A rich well-drained soil is needed for the begonia to thrive. They grow best in containers that are at least 6 inches deep or in raised beds that have soil that has been loosened to a depth of about a foot. An organic mixture of 1/3 sand and 2/3 peat spagnum peat or leaf mold is considered an ideal planting medium that will give proper drainage. The tuber should be planted slightly below the soil line. If planted too deep, the tuber may rot. The top will be the depressed side of the tuber. Roots grow from the bottom, sides and top of the begonia tuber, but the stalks will come from the top. Additional nutrients, in the form of a manure tea or fish emulsion will keep the begonia thriving throughout the growing season. Stop feeding the begonia plants in the fall. Begonias need a regular supply of water, but over watering can cause problems. The soil should be dry to the touch before watering. If flower buds drop off of the plant, it is either getting too much or too little water. Container planters will dry out faster, so the soil should be checked more often for moisture content. Avoid mildew problems by watering the begonia in the morning. Add water to the soil carefully, avoiding the foliage of the begonia plant. Slowly reduce the water given to begonia plants in the fall as they move into the dormant stage. The begonia is considered to be a tropical plant and it does not tolerate cold temperatures. Sudden temperature changes can also stress the begonia and cause buds to drop off the plant without blooming. The best conditions for the begonia are temperatures below 80 degrees in the daytime and cooling to below 60 degrees at night. The begonia may not survive a frost. The bulbs must be dug up in the fall and stored indoors over the winter, during the dormant stage. The bulbs are ready for digging when the leaves start to turn yellow.